I’ve been following Chris Brogan for about a year; Chris, through his company New Marketing Labs, works with large and mid-sized companies to improve online business communications like marketing and PR through the use of social software, community platforms, and other emerging web and mobile technologies. A colleague recommended that I follow Chris to glean strategies that would support my growing business. I have in fact integrated quite a lot of the valuable and relevant information imparted in his blog and video posts, have been directed to other savvy professionals that he has mentioned in his posts, and have perused some of the books he suggests. Chris’s message of building community by offering yourself and your particular area of expertise to others, willingly and genuinely, resonates with me. So I jumped at the chance to build my community alongside Chris, when I read about the introduction of his latest venture, Man on the Go–a travel advice and information website for the traveling professional (although the information applies to anyone that travels…). I contacted Chris, created my first ever video, calling it Healthy Travel Tips for the Man on the Go, and loaded it to YouTube. He posted it yesterday on the Man on the Go website, and hey, I’m off and running. I’m excited that we’ll be collaborating to share an important message. 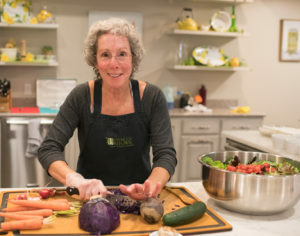 Via the manonthego.com website, I will be sharing weekly healthy travel tips about eating well, staying physically active, and eliciting the relaxation response–all in the context of business travel–so that taking good care of your physical and emotional health is simply a routine aspect of every day. When the busy professional optimizes his or her personal health and well-being, there is a noticeable enhancement of business success. Taking care of YOU on a personal level leads to professional accomplishment and prosperity. Now that’s a undeniable ROI.